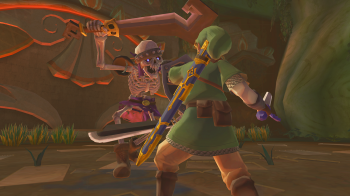 The latest Legend of Zelda game is coming out in time for the holidays. It's been a long time coming, but Nintendo has finally revealed when the world will be able to get its collective hands on the latest Legend of Zelda, or at least, when some of the world will, anyway. The European parts of it, specifically. Skyward Sword arrives in European stores on November 18th, just in time for the holidays, pitting it against games like Skyrim, Modern Warfare 3 and Uncharted 3. Skyward Sword is the first Legend of Zelda games to be developed with the Wii exclusively in mind. Twilight Princess, which was released in 2006, was actually designed as a GameCube game, but was delayed in order to be ported over for the Wii's launch. Skyward Sword mixes up the standard Zelda formula a little by making Zelda and Link childhood friends in the land of Skyloft, rather than Princess and Elf-Boy in the Kingdom of Hyrule, respectively. Link still has to rescue Zelda - Nintendo hasn't thrown the formula away - but series overseer Eiji Aonuma has promised that Skyward Sword will mix things up, especially when it comes to the gear Link gets, which in turn effects the puzzles and boss monsters he encounters. Legend of Zelda: Skyward Sword comes out for the Wii on November 18th in Europe. Update: Nintendo has also revealed the North American release date. The game hits shelves in North America on November 20th.